Embedded augmented reality-chip technology means we'll finally start using AR for good instead of filling all the app stores with Predator, Terminator and Robocop camera overlay apps. Nah, I'm just kidding, it's probably going to get worse. Reuters reports that Total Immersion marketing chief, Antoine Brachet, says that they've been working with Intel to bring AR to Intel's chipsets. Intel owns a stake in Total Immersion. 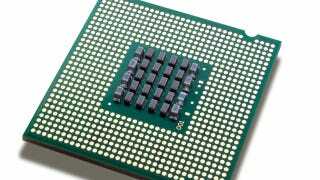 According to Brachet, the chip could hit the market in two to three years. What we are doing together with Intel is working on their chipset ... so inside the chipset you can have some AR features, like gesture recognition that can be transferred from software to hardware. AR technology baked into a chip would mean that applications wouldn't have to include the technology for gestures recognition and the overlaying of information on images. Potentially, all an OS would need is drivers for the chipset to enjoy AR features.